Try not to spit out your coffee as you check the price of the Diamondback Tactical FFP from Vortex after reading about its impressive performance and features. The first focal plane reticle, a feature ordinarily reserved for 4-figure-priced optics, allows shooters to use the information-packed EBR-2C reticles for ranging, holdovers or windage corrections on any magnification. 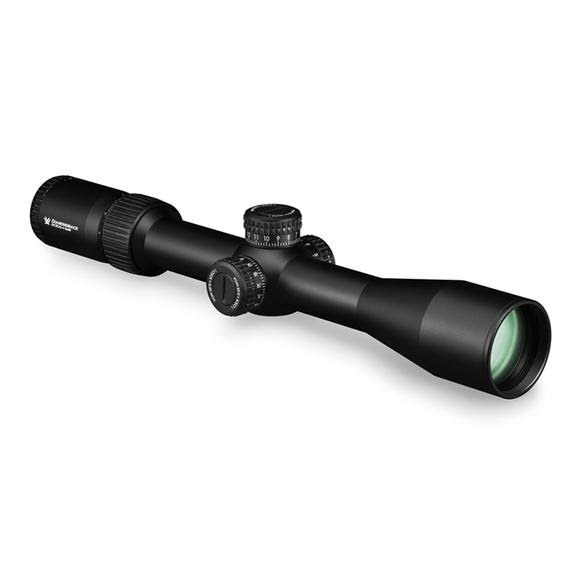 Housed inside its durable, one-piece aluminum tube is a 4x optical system delivering excellent edge-to-edge clarity and sharp resolution. Exposed elevation and windage turrets are low profile enough to stay out of the way in packing situations, but offer the quickness, ease and precision of dialing accurate shots at distance. A side adjustable parallax gives shooters peace of mind by removing parallax error from the equation from 20 yards to infinity.